This Longines dress watch came in for me to take a look at. It has a Longines 280 movement. The serial number dates this watch to 1961. Click here for more information about how to date a watch. The watch did run but it didn’t keep time and it kept stopping. The lugs (2 of them) were bent. The winding stem was bent and the crown and the crystal were in a bad shape. At first glance, the movement looks clean. I did notice that some old lubrication clogged up the escape wheel bearing jewel. Something like that will easily cause problems for your watch. Remove any power from the mainspring. Lift the balance and the pallets. Remove the ratchet wheel and the crown wheel. Usually, a reverse fretted screw secures the crown wheel. 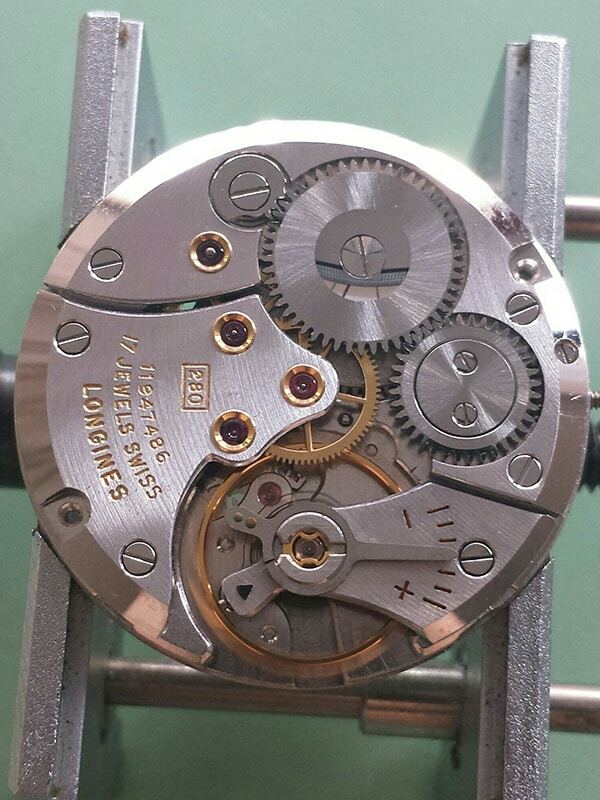 This Longines has 2 little screws with normal screw threads to secure the crown wheel core. Then, lift the barrel bridge and the train-wheel bridge. Then remove the gears and the main barrel. I put the main barrel aside to examine. This is why the watch keeps stopping for no obvious reason. As you can see in the picture above, this is a main barrel that has a mainspring with a T-end. The Longines 280 comes in 2 different versions. With a T-end and with the normal bridle. It looks like someone tried to fit a barrel lid of the normal main barrel onto this one that has a T-end mainspring. A cover for a main barrel with a T-end mainspring has a little notch to secure the T-end. This cover doesn’t have a notch so naturally, the mainspring is bent and the cover is warped out of shape. These main barrels are sealed units. That means that you should replace the whole unit in a service. They aren’t designed to open and clean them. Unfortunately, I can’t find the correct part to replace. Turn the movement around to remove the motion works and the keyless works. Put all the parts in the watch cleaning machine for 6 minutes per bath. Start with the 3rd wheel and the main barrel. Then the rest of the gear train. Replace the train-wheel bridge and the barrel bridge. Fit the crown wheel and the ratchet wheel. Turn the movement around and reinstall the motion works and the keyless works. Turn it back around and reinstall the pallets and the balance. I’ve cleaned and lubricated the movement, fitted a new winding stem and a new crown. I’ve also fitted a new crystal. Sadly, this Longines still doesn’t run. A lot of parts are getting more and more rare every day. Besides the skill and know-how, you also need access to the correct parts to repair or restore a vintage watch. Some parts are ridiculously expensive if you can find them. Other parts are just obsolete and you can’t find them anywhere. The fact that the Swatch group has stopped selling parts to independent repairers doesn’t help at all. Did you have some watch projects that didn’t go as planned as well? Do you have some tips on how to get the correct main barrel for this Longines with caliber 280? Let me know in the comments below. An interesting article Melvin..and possibly a cautionary reminder for both new and even more experienced vintage fans or collectors that t is always worthwhile checking on spare parts prices and/or availabilty before buying certain vintage brands or individual calibres. Even prestige brands can lose value if they no longer function as a working watch . Yes, you’re right. 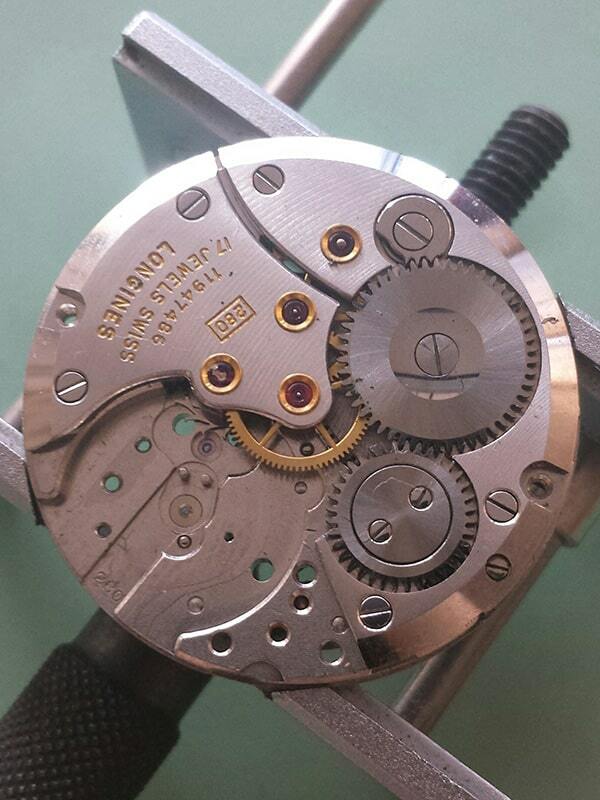 Parts are very difficult to find for some Longines movements. I think it would be wise to assume that not all watches sold for repair can actually be repaired. Lots of sellers know perfectly well what they sell. I inherited a vintage Longines cal 280 watch that was my father’s. It would not hold a wind longer than 12 hours. You could feel and hear the mainspring slip after about 10 winds. I searched eBay for a year and finally lucked upon a NOS sealed barrel (Swiss part no. 180/1) in the U.K. just had it installed in the watch. It now has a full 42 hour battery. It’s a shame parts are so rare for these fine timepieces. Well done in finding the correct part. That’s one heirloom piece saved. I’m afraid that most parts will be obsolete if the vintage watch market stays booming for another 5 to 10 years. Unless manufacturers or third parties start making parts for vintage movements again.